I fell in love today. I met a little osprey chick who, for some reason, totally captivated me. Now, I have met literally thousands of osprey chicks over the years...but this little guy was so precious. He is an only chick, and is about ten days to two weeks old...and I was mesmerized as I watched his Mom feed him. The male watched from a high dead tree overlooking the nest. He opened his little beak and reached out for that juicy bit of fish with such eagerness...only aware of his small world on that nest. He is not even old enough to be looking around at the larger world around him. I don't know...something special about him, and the time I spent crouched on the ground peering thru my spotting scope at this precious little being. With no feathers on his breast, his crop stuck out, full of fish, looking like he swallowed a golf ball. Just so damn cute. Yup, I fell in love, again. Checking nests non stop these days since I will have a week or two of not being able to. One nest did blow down in that terrible storm a week ago that toppled so many trees and shut off the power. Very sad, but it happens. It looks like they have begun the rebuilding, tho I did not see the birds when I visited. I am enjoying conversations with other osprey researchers about the extra ospreys that we see visiting the nests and the differences in responses by the residential pair, from nonchalance to aggression. Also recieved an interesting documentation of an eagle killing an osprey chick by dropping it in the water. We have so much to learn from each other, by sharing our observations and thoughts. I posted earlier about a male that was going between two nests and two females. Both nests have hatched and I see that there are three chicks at both nests. I was hoping for some smaller broods, but this guy has gotten himself in real trouble! Now he has NINE mouths to feed, including his own. No wonder I never see him anymore...he must be fishing all the time and dropping fish here and there. I do have some serious concerns about those chicks. The females will probably have to do some of the fishing, and there is already evidence of that. This leaves the chicks vulnerable, when they are unattended. Will some of these chicks starve to death? Will he pull it off? The one other time this kind of situation occurred in my study area, one of the nests failed during the incubation phase, when that female had to leave the eggs too often to get food. However, this male has managed to provide for these two females well enough to get all these eggs hatched. I will keep you posted! For those of you wondering about the Arboretum nest, I have been out to check them in person. Absolutely no signs of hatching. Both birds were seen, preening, egg rolling, snoozing with no feeding or tending to chicks. I am wondering if the nest is in the process of failing. Time will tell. I have found several additional nests that have failed, so the numbers are mounting. On a happier note, I am beginning to be able to count heads on more nests, tho some chicks are still so small for this time of year. For anyone looking for more information about the Arboretum osprey cam...do scroll down for other postings about those birds. Also click on the link to our Facebook page, to the left, for more info and conversations with viewers about the cam. 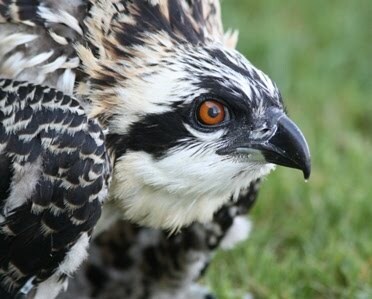 In my twenty years of studying ospreys I have discovered that most ospreys incubate for 39 days before hatching. Osprey researchers in Pennsylvania, who did the first reintroduction and early research on these birds, also documented the same incubation period. Some others have stated there is a 38 day incubation with ospreys. Also we did observe a broken egg on the Arboretum nest. There were originally two eggs laid, but broken egg shells were observed a few weeks ago. Viewers have observed intruding ospreys causing commotion at the nest,( video on the Facebook page) so it is presumed that it was during nest defense that the egg was damaged. The remaining egg should hatch anyday now if it is fertile. The second egg was laid on May 16 and 39 days would bring us to June 23... Tho we do not know which egg was broken, but we should see hatching by the 23rd. Many eggs are not hatching this year ...probably due to the cold rainy weather which may have caused eggs to die, and a delay in copulatory behavior as a result of late returns and frozen lakes (no food source ). The timing of copulations may affect the fertilization of eggs. Ospreys can and do break eggs ...as was evidenced by an osprey in Montana who destroyed a nest full of eggs that were fertilized by a different male. Also for the record...Xcel Energy was the power company who put up the nest pole which the cam is on. Much appreciation to them for all they have done over the years. Read on for more info about these amazing raptors! Thanks to all the volunteers, nest hosts and people in the public who have been so patient and understanding when I am not able to respond to all your emails as quickly as you might hope. I have received an increased volume of emails after the notice in the Star Tribune and the link posted on the Arboretum nest cam page. Sometimes it is overwhelming, as I also have another job, am monitoring well over 90 nests, supervising many amazing nest monitors, maintaining a Facebook page and blog, and dealing with some personal health issues. Please know that I am trying to respond to every email as soon as possible, but when there is a request for information that I don't have handy, it may take me some time to get back to you. I value each and everyone of you who have shown an interest in these birds, and I am not ignoring you or withholding information. I am just overwhelmed right now and sometimes I just plain forget. Gentle reminders are welcome. I will be facing some surgery in the weeks ahead so please be patient with gaps in communication . Thanks so much for your generosity of spirit, your time, your patience and all the touching, appreciative comments that I have received recently. I am so glad you are enjoying this page, my work, and that we can share our passion for these birds! I treasure you all! It takes a village to watch over these magnificent birds! PS Nest monitors are always needed! I am still surprised by some things I see. Today I observed a male brooding the chicks while the female was in a tree preening! Usually the females do all the brooding of young chicks...so when I saw the female in a tree I thought they must not have hatched yet. (The males do incubate.) But the male was looking down all the time, which is often a sign that hatching is occurring or has occurred. I was scratching my head and trying to figure it all out...and up popped a tiny little head! Yup they have hatched and dear old dad is doing the brooding! Today's tidbits...here it is mid June and many nests have still not hatched. It is becoming clear, slowly, that some nests won't hatch. They seem to give up slowly, after incubating too long, and oddly enough it is often the females who give up first, while the males will continue to incubate. Eggs are left uncovered for increasing lengths of time as they slowly seem to realize that the eggs will never hatch. On the other side of things I was able to observe some fairly big chicks today...fully two weeks old. Bopping around on the nest, pecking at each other, reaching out for food and toddling to the edge of the nest to look around at their world. I love that. Taking in the landscape called HOME. I found a missing pair of ospreys today YEAH! Am still seeing a lot of extra ospreys visiting established nests, bothering the residential pair, trying to land, getting chased off. Those males have to be vigilant about defending the territory. One volunteer got some great photos of just such a skirmish and we we able to ID the visiting pair as being from another nest that had failed. Interesting to see how they move around, and how they behave when they have no chicks to raise. Making a little trouble in this case. Hey osprey fans....I understand that this morning there two eggs visible in the osprey nest at the U of M Landscape Arboretum , and this afternoon, only one is visible. Did anyone see anything happen today that might explain the missing egg? I was not able to watch today and my iPad is now not showing the live stream...it keeps freezing. So I thought I would put the question to the osprey watching public. Any observations to share? I am seeing a fair number of extra osprey visitors at many nests, and sometimes they try to land, which can result in a skirmish. Did some interloper break an egg? Did one roll out of the nest or is it buried in new nest material? PS. We can see a broken egg in the nest. Don't know what happened. Bummer. I don't remember when the first egg was laid but the second was laid on May 16. Most ospreys in this area seem to incubate for 39 days so the projected hatch date for #2 egg is June 23. Of course we don't know which egg remains so it may be #1, which may hatch a day or two earlier. Time will tell. Hoping for no more broken eggs and a successful hatch. This might be the last chance for Mr 79. Here is a little update...I have read 83 bands and I know of 9 nests that have hatched as of Saturday, June 8. That will change daily now. As some of you may know, ospreys are asynchronous hatchers...meaning the chicks do not hatch at the same time, as ducks and geese do. Ospreys begin incubating after they lay their first egg and therefore they also hatch in sequence. This means that there can be as much as a weeks difference in the chicks ages. The difference can be very noticeable at the beginning, but by the time they fledge its hard to tell the difference. There is a stage, at about ten days to two weeks of age when they do engage in some sibling aggression. Many times i have observed the older chicks pecking at the younger ones. Siblicide is reported in the literature, tho I think it is uncommon. They usually establish the "pecking order", literally, and then that aggression seems to cease. If there is not enough food for all the chicks, some may die. I have seen runts that do not survive but I am not sure it is a direct result of sibling aggression. With all the new cams on nests, we may learn more about this aspect of sibling relationships. They usually produce 2-3 chicks, with 1 or 4 also seen. In my 20 years of studying ospreys I have seen broods of four chicks five times. Those occurred at two different nests. In all cases, all four chicks survived to fledging age! There are some very interesting behaviors and I need some help monitoring them. Thanks! Here is a link to a short notice in the birding column of the Star Tribune...we still are hoping that people will report new nests to us so we can maintain an accurate study of the ospreys in the metro area. The chicks have begun hatching! Fun to watch the wee ones being fed, tho we can't see them...we can see the adults taking small bits and leaning into the nest cup to offer it to the chicks. Males become very curious and attentive...staring into the nest up. Females are more restless, looking down a lot. It will be about ten days or so before we may be able to see their tiny heads reaching up for food during a feeding. Even after 20 years, it is still thrilling to me! Life goes on...watch carefully and you will see the signs.